Jennie Smiths delicate graphite drawings combine close observation of the natural world with a deeply imaginative sensibility. Her body of work reflects a fascination with the environment, a willingness to confront ecological crises, and a determination to explore the beauty and mystery inherent in what she sees. In her selection of drawings on display at the Townsend Center, Smith presents a new project exploring our psychic investment in our landscapes of origin. 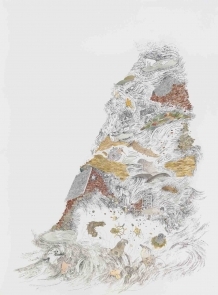 Her biographical maps render the ways in which individuals remember the places in which they were raised. Her creative process involves asking friends to describe a significant place where they spent time during their childhood. Smith then creates a map that gives visual expression to these memories and is a testament to the enduring effects of landscape on the psyche. Smith, a San Francisco native who lives a short walk from the Pacific Ocean, also presents a new installment in her career-long engagement with the Northern California coastal environment. The Townsend Center exhibit includes pieces inspired by such Bay Area phenomena as the movement and sound of rattlesnake grass, and the windswept cypress trees along Lands End. Smith received an MFA from UC Berkeley and a BFA from the Minneapolis College of Art and Design. Her work was included in the 2006 Whitney Biennial and is held in the Whitney Museums permanent collection. She is represented by the Rena Bransten Gallery in San Francisco. Her illustrated book of folk songs, The Littlest Birds Sing the Prettiest Songs, was published by Chronicle Books. Viewing hours are generally Monday through Friday, 9 am to 4 pm. The exhibit is located in a space also used for events and meetings; please call (510) 643-9670 or email in advance to confirm room availability.